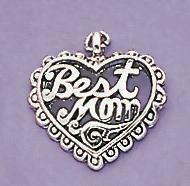 Silver "Best Mom" Heart Charm or "I Love Mom".Please specify when ordering. Special: any order over $30.00 receives a free mothers day heart for very $30.00 ordered. Please note in some cases the charm may say #1 MOM. Orders do not have to include this item as part of your purchase.